An easement is the right to use another person's real property for a specific purpose. This is a non-possessory interest in property, and can be either appurtenant or in gross. In North Carolina, the holder of a legal or equitable title of an interest in real property can create, grant, reserve, or declare valid easements, restrictions, or conditions of record burdening or benefiting the same interest in real property ( 39 6.4). All real property documents in this state must be executed and acknowledged in strict compliance with the acknowledgment provisions in North Carolina in order to be recorded and to provide constructive notice. An easement deed must be signed and acknowledged by the grantor. An individual form for acknowledgment by a grantor is presented in 47 38 of the North Carolina Statutes. Acknowledgments must be taken before an officer who is authorized by the state to take acknowledgments of deeds. Documents that are executed and acknowledged out-of-state can be recorded in this state, but they must conform to North Carolina law. A person who owns or acquires any deed or agreement for rights of way and easements of any character shall record such deeds in the office of the register of deeds in the county where the affected land is situated. If such deed or agreement has been acquired, but no use has been made of the easement, the person holding such instrument is not required to record it until within 90 days after the beginning of the use of the easement granted thereby ( 47 27). 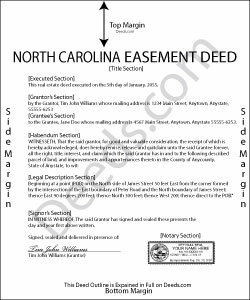 No deed, agreement for right of way, or easement of any character will be valid against any purchaser for valuable consideration but from the time it is registered with the register of deeds in the appropriate county in North Carolina ( 47 27).